OTTAWA - The volatile Canadian labour market stopped well short of expectations last month, surprisingly shedding 28,900 net jobs after predictions had pegged the economy to pump out thousands of new positions. 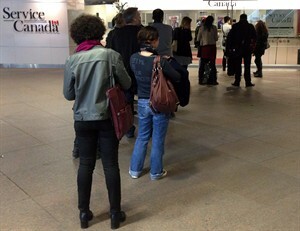 April's unemployment rate stood firm at 6.9 per cent for the second straight month, suggesting that some Canadians had given up looking for work, said Statistics Canada's latest jobs report, released Friday. The results of the Labour Force Survey dampened modest expectations of economists, who, according to Thomson Reuters, had anticipated an increase of 12,000 jobs. Instead, the country absorbed the biggest one-month employment setback of 2014. The last time the Canadian economy saw such a drop was December 2013, when it lost 44,000 jobs. "There's no question this was a bit of a disappointment," said Douglas Porter, chief economist with the Bank of Montreal. "It continues a trend we've seen over the last six months of down then up, and up then down. So we're seeing a see-saw action in Canadian employment." The loonie tumbled about two-thirds of a cent to 91.73 cents US following the release of the job numbers. Looking at the broader picture, the April losses followed a gain of 42,900 net new jobs in March, which means 14,000 jobs were added over the two-month period. Beyond the monthly volatility, Porter said the take-home message is that Canadian job growth is cooling down. "But we're really not seeing a big improvement on that front." The report showed 30,900 full-time jobs were lost in April, compared with the addition of 2,000 positions in part-time employment. Employment numbers eroded in seven of the 10 provinces, including Quebec, New Brunswick, Newfoundland and Labrador and Prince Edward Island. Quebec saw the most jobs wash away, losing 32,000. Meanwhile, Ontario created 17,600 jobs in April, the most of any province. The report found there were 27,100 fewer jobs held by young Canadians aged 15-24, while the youth unemployment rate stayed put at 13.4 per cent. The number of employees plunged in April to a loss of 46,000 jobs, a figure that was offset in part by the addition of 17,200 self-employed positions. Derek Burleton, deputy chief economist for TD Economics, said in a statement, said the "employment pendulum continues to swing violently." "The extent of the weakness in job creation in recent months has been surprising given the reasonably positive readings flowing from employer surveys and signs of continued moderate growth in the economy," he said. "While there had been hope that this puzzle would have been solved today with a strong employment reading, we continue to be left waiting." But even with the spring stumble, some analysts remained confident the country's 2014 outlook would be favourable for Canadian job hunters, with the help of stronger economic growth. "When we take the longer-term view on it, we're still seeing growth in employment," said Andrea Ziegler of the employment website Workopolis. "What we seem to be seeing more recently is two steps forward, one step back." Ziegler hopes more Canadians will start embracing the idea of moving in order to land a job, particularly toward western provinces anxious to find workers. She said around 10 per cent of the searches on Workopolis are for out-of-province jobs, but in underemployed Ontario, only six-per-cent are looking for work beyond their borders — the least of any province. "I think we have become less mobile as a country," she said. Others found positives within the data for certain areas of the job market. Tom Turpin of the Randstad Canada recruiting company said new construction projects across the country have hiked the need for skilled trades, industrial support and management by 30 per cent compared to 2013. "Considering the job loss, there is still a silver lining within certain industry sectors that are experiencing a spike in demand," he said. The report found that jobs were created for the second consecutive month in business, building and other support services, which saw an increase of 26,100. However, employment in finance, insurance, real estate and leasing dropped by 19,400 in April, while the biggest loss struck the accommodation and food services industry, where 32,200 fewer people found work. Even if job numbers rise in the coming months, an economist with the United Steelworkers union said he fears they will not increase quickly enough to keep up with Canada's growing working-age population. Economist Erin Weir said April's 61.5-per-cent employment rate — the proportion of working-age Canadians who have jobs — is now down to its lowest level in four years. "The federal government has actually aggravated this lack of job opportunities by massively expanding the temporary foreign workers program," Weir said. He urged the government to respond by adjusting its controversial temporary foreign workers program so it only addresses specialized occupations where there's a proven shortage of qualified Canadians. Several experts also said April's numbers should be viewed with caution, considering that Good Friday fell on the survey week. CIBC chief economist Avery Shenfeld said Statcan's seasonal adjustments does not fully control for the shifting time of that holiday, when fewer hours are worked and Canadians often take more time off. "The last time Good Friday fell in the survey week for April was in 2003," Shenfeld said in a statement. "In that case, not only did hours worked take a nose dive, but employment dropped (13,000) vs. an average gain of nearly (30,000) in the six months leading up to that month."